It was in the evening, the streets white from the snow and already deserted, when I was driving to Weikersheim, a small village in rural Franconia (which is a part of Bavaria). On my way my navigation system suddenly failed and when I compared my old-fashioned map to where I actually was I realized that I had lost my way. The shock of this discovery made me feel uncertain but accidentally I finally found the village. I had never been to Weikersheim before and therefore I was not acquainted with the village at all, fortunately there was a man in the empty streets, I asked him the way. The temperature was -8° C.
W71, the club, does not even have a proper address and only two cars parked in front of it. When I entered, there was not even an admission counter. But unlike in Kafka’s story “Give it up” no one turned with a sudden jerk, like someone who wants to be alone with his laughter, there was only Dave Rempis (saxes) next to a table arranging LPs and CDs. 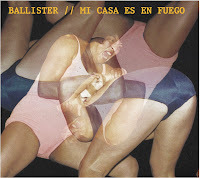 Within 30 minutes some people arrived and finally Ballister started to play and from the very first moment the place was on fire. Ballister soon got it all together – their rock approach, their excellent musicianship, their ability to play together, the fun they obviously have. I was glad I made it to this godforsaken place because live they are simply marvelous - but what do you think of their new album, Paolo? Martin, first of all let me say that I’m relieved you came back home safely from the arctic moors of Weikersheim (by the way I was already coordinating a rescue operation with the rest of the Collective). I believe that your brief description of the Ballister live performance there is well applicable also to this album (it’s a live recording from a Montreal’s gig - do cold temperatures influence the trio? Should we make a comparison with a set in a tropical venue?). The first act “Cockloft” is like a long-distance runner. Rempis, with his clean phrasings, is the engine and the pulling of the composition. He grows in intensity without being aggressive, and he seems to set the interplay with his companions in two separate moments and with two different moods, respecting both the rockish actions of Paal Nilssen-Love (dr) and the often ethereal distorted presence of Fred Lonberg-Holm (cello) - here on tenor guitar, not forcing them in a cohesive interaction until they don’t want to spontaneously step in. He’s aware he must be cautious playing simultaneously with two double-surnamed musicians. Listen to the percussive duo with the deflated bass drum after three minutes and then the feeble, incorporeal dialogue with the cellist we find after, preluding to the long meeting between skins and strings in the middle of the same track. Now the trio is finally amalgamated. You can notice it immediately at the beginning of “Smolder”. After some minutes of more orthodox improvised inlays, especially from the sax and the guitar (Lonberg-Holm is clearly not a guitarist but his approach, in some way shy, achieves in my opinion a good result), the time has come to erupt. Loud but again really controlled, especially in the marching couple of closing minutes. The third act “Phantom Box System” starts again quiet and slow, climbing up to a central noisy acme. Then we are back to a sparse, diluted atmosphere with a long drum solo joined shortly after by Lonberg-Holm, for the first time in the record audible on some bass strings. After a few peaks reached in communion with Rempis, the trio decides to slow down dismantling the composition as much as the cohesiveness of their interplay. Coming back to the tale of your adventure, the famous Korzybski’s phrase “the map is not the territory” comes to my mind. Once again this may be applied also to what we find in this record. We have three powerful explosive musicians, often known for their sonic outburst, that deliver some fifty minutes of good music choosing to interact mainly in a delicate way - or at least more delicate than their usual standards. Because clearly improvising also means that no path is set in advance, despite your attitude and your consolidated skills, although the deep and mutual knowledge of the interlocutors, beyond also the intrinsic contradictions in the idea of a totally free improvisation, the result is always and at best an imitation of what is in the mind of the musicians and in the ears of his listeners. They were in a cold place, they could have give vent to any sonic force, but they went for a calm approach. This free jazz is really incomprehensible. Or maybe again they were just cold. In any case, if my noisy expectations have been disregarded, I can only say it has been a welcome surprise. Paolo, in Weikersheim it was a completely different gig, even with similar components as on the album. Here Nilssen-Love and Lonberg-Holm were the driving forces backing up Rempis, who looks like a giant seal snapping for air and who used his newly won freedom to play very expressively and light-headed in the high registers. Nilssen-Love was simply sensational pulling out all the stops from straight rock rhythms to stroking his kit tenderly and surprising interruptions like hand-clapping and hand drums. Unlike the set on the album Lonberg-Holm was on cello only and sometimes he used a whole bunch of effects like sustains, feedbacks and delays to build up a wall in front of which Nilssen-Love and Rempis could trade blows. You could also see Nilssen-Love smiling while Lonberg-Holm was doing this, obviously the band was really pleased with the performance. It was even colder and hardly anybody was on the highway when I drove back, it was a scenario as if there was a nuclear blow. I had forgotten that it was so cold, the way was easy to find, Ballister made my day. Guys, that's not really the album cover, is it? That's an April Fool's Day joke, right? it is the album cover, it is no joke. The cover of their last album was in the same style, but I must say that this is okay for me. Unfortunately it is no joke. Come on guys, It's not that bad. I think this is really punk. Can't you smell at all the sweat from the ladies fighting? To choose a discordant (I mean from the music in the album) cover art is already a form of art!